Guess who made the best CEOs list? 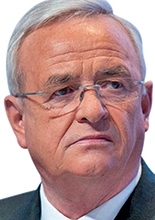 Winterkorn: Timing is everything for ex-VW CEO. Take it from us, early deadlines can be inconvenient. The prestigious Harvard Business Review published its annual list of Best Performing CEOs last week -- a list that sought to measure the top executives' effect on shareholder return as well as their company's "environmental, social, and governance performance." Nine automotive CEOs made the 100-person list, including Continental AG's Elmar Degenhart in fourth place and Valeo's Jacques Aschenbroich in 14th. But topping all the automaker CEOs -- including Dieter Zetsche of Daimler at No. 86; Renault-Nissan's Carlos Ghosn at No. 40; Norbert Reithofer, former CEO of BMW, at No. 30; and Fiat Chrysler's Sergio Marchionne at No. 27 -- was Volkswagen CEO Martin Winterkorn, who ranked 20th on the list. Winterkorn resigned Sept. 23, a few days after VW's admission that it cheated on emissions testing for 11 million diesel cars worldwide.